It was all so devastating and then so happy. Monday afternoon, Mom disappeared with Puppy. Dad was telling me she'd be back, I learn from example you know? Anyway, I cuddled up right close to Dad on Monday night, just to make sure he wasn't going anywhere. I looked for Mom EVERYWHERE on Tuesday. Still no sign. Then again on Wednesday. Nothing! This afternoon, there I was having a snooze when I hear the door open. So I get ready to run out the bedroom door as soon as it opens. Whose standing there? Oh my Dog! I almost didn't make it down to the backyard before peeing I was SO excited! So, now we're all back home together and I can relax and get back to taking care of her and Puppy and Dad. Oh my dog, look at this, a Monday Morning Report....written in the MORNING! Downside is it's WAY early. Mom better open the back door for me soon, my bladder will be waking up anytime now. I had a fantastical Noseventure filled weekend! First off on Sunday I was allowed to wake up gradually - unlike today. Wait, no, not complaining. If I complain I may never be able to blog again! GASP! So I'm not complaining! Where was I? Noseventures! The first Noseventure I went on was to drive Daddy into his other work. I haven't had to do that in a while, so it was a nice change. Then Mom and Puppy and I were off to someplace new! Don't you just LOVE new places? Those are the ultimate Noseventures! What was best about this new place was that Grandma and Grandad were there! Not only was it a new Noseventure place but there were ear scratches involved! Here's a picture Grandad took of the three of us. That's mom's leg and her hand giving me ultimate chin scratches. Sigh. There are more Noseventures, so keep reading! Wait, the Noseventure isn't over yet! We ended up at Great Granny's House! That was awesome because I had to patrol her yard for her - just to make sure everything was safe you know? Then she let me sleep on her sofa. I think she loves me. Finally we made it home. Sigh. Isn't that a Fantastical Nosventure? Well worth a Monday Morning Report! 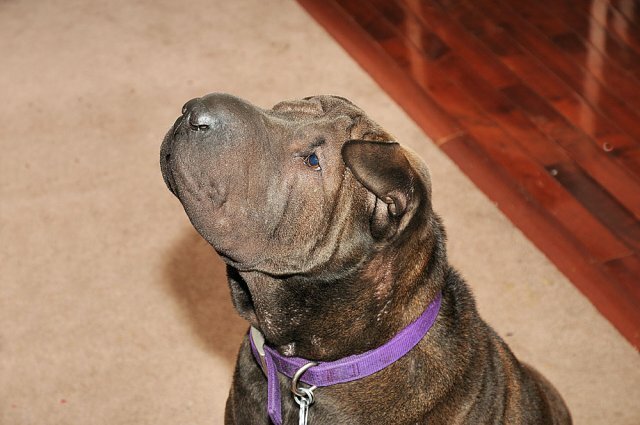 Miss Lola Shar Pei mentioned that she's not a big talker, and normally Shar Pei aren't. My and Dad's First Dog, Shih Kwan, was a quiet fellow too. We're normally pretty quiet. If you were around then, this picture won me a Gold Medal at Lenny Lenshaw's Pawlympic Games two - or was it three? - summers ago! I'm especially good at barking at things passing outside my front door, my back door, the gate from the backyard and anything I happen to see from a window. I also sing and Mom calls it whining when my parents come into the house and I'm stuck upstairs in my room (sometimes it happens that the door closes when I'm not looking, you know how that is right?). So there I was, chewing on my bone in my living room, making sure Grandma was taking good care of Puppy when Mom was out doing Mom stuff, when my Shar Pei sense started tingling. I could sense someone at the front door so I barked out a warning, in case Grandma had to do a duck and cover with the Puppy to protect him (you know how it is right?). Do you know who was at my front door? DAD WAS! WOHOO! I did my happy dance. That's when the terrible thing ALMOST happened. Mom had snuck in from the BACK DOOR! OH MY DOG! I almost missed her! I danced my way over to her to let her know that I missed her HORRIBLY! I also had to give her my report on how good a job Grandma had done in looking after Puppy and I. You can only imagine how excited I was to have both my pawrents home. They really should come in the door together though, don't you think? Still no new pictures. I wonder if Mom has lost her camera. I'm going to have to have a talk with her. The camera hasn't come out for a while, so we're stuck with older pictures. Although, I was pretty darn cute at 4 months old wasn't I? I realize that what happens at Date Night stays at Date Night, but What did you guys do? Holy Dog! Bolo has been sleeping all morning. I'm guessing that means he had a good time with Miss Lola Shar Pei. I've had a busy week taking care of Mom and Dad and Puppy and snoopervising all sorts of stuff. Yesterday Dad and our neighbour were outside and on the roof (Dad wasn't the one on the roof). Then all this gunk came swooshing down the pipe outside the house. Gunk gunk gunk! It's hard to snoopervise people on the roof from inside the house, FYI. Then today I went to Day Care to snoopervise there. I'm surprised they can go more than a day without me honestly. They're always so happy to see me there. Oh, and Mom has been cleaning gunk out of my ears too. I've been surrounded by gunk and just realized it. Anyway, here's a picture of me, just so you don't forget what I look like. Ladies and Gents, let me be serious for a moment as I give you my Monday Report. The weekend went by with not enough walkies, ear scratches or Noseventures. It did include a B-A-T-H , which my parents said was so that I'd be nice and sweet smelling for my date with Miss Lola Shar Pei this weekend. I don't believe them for a second. I also had to get my ears cleaned, and if patterns hold true, I'll be getting my ears cleaned again tonight. Blech. I did just have a great Noseventure with Dad. Just a walk through my neighbourhood, but it was still a great Noseventure. And that's about it for my Monday report. 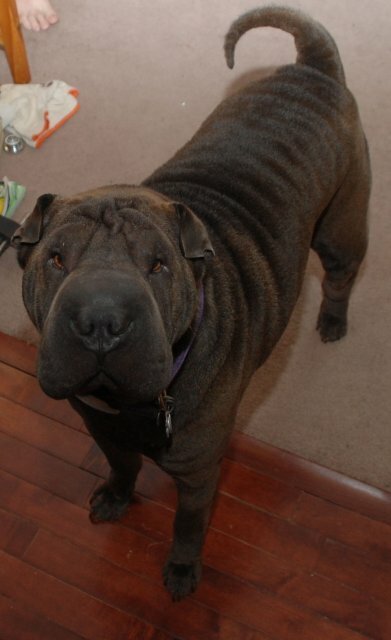 Pei-Ess, Miss Lola Shar Pei's Dad wasn't feeling good this weekend, but last I heard he was feeling better. If you haven't yet, go and send them the Power of the Paw, so he gets to be 100 pawcent! Pei laughter. Mom said it would be nice to get Miss Lola something special for the occasion. I thought flowers, or cookies but Mom said she might be allergic and yeah, cookies would be nice but it might suggest that I wanted her to get fat. (I think Mom has been watching too many profiling shows). When we told Grandad that I was going out on a date with Miss Lola, Grandad started singing. Just one line, but it gave Mom and I an idea and we asked Dad to help. Apparently there's another famous person named Lola (I didn't know that, but it wouldn't surprise me if she had been named after Lola Shar Pei). You can find her song here. Dad basically used the melody. Mom and I wanted to plan something special but I just posted too many things that she couldn't get her act together fast enough! This blogging in the evening works better for us than blogging in the morning. It's an older picture, but I've been thinking a lot. I've been thinking how much my parents rely on me - I looked after Dad this weekend - he was sick. Yesterday I looked after Mom - she was sick. 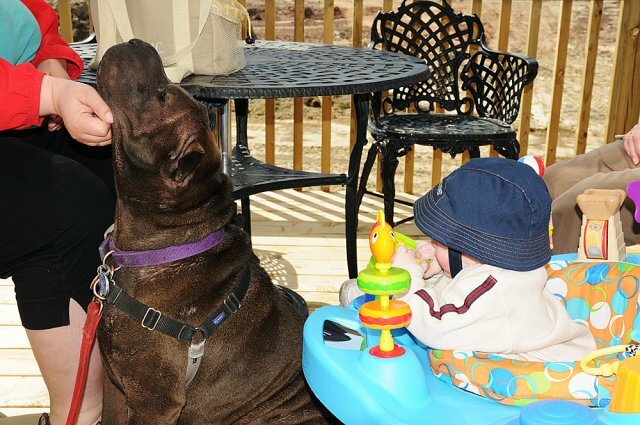 Then, I noticed in my comments that my friend Lola Shar Pei invited me on a date. I had to think about that. I'd love to go chasing squirrels with you Lola, if it's not too late, but just so you know, my heart belongs to Mom. The camera hasn't come out in a while, so we'll see what Mom and I can comes up with for Photo Friday. 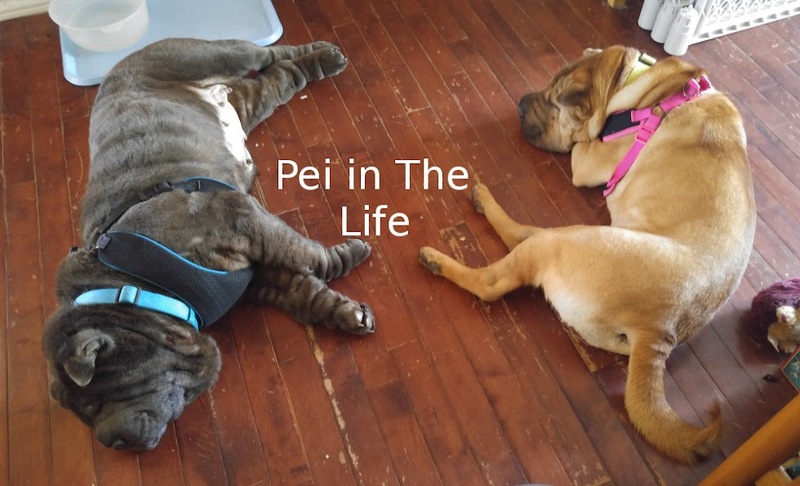 Or maybe Find the Pei Friday. Gotta think about that. Can't talk, Mom and I are looking after Dad and Puppy. They're both sick now. I'm in charge of cuddling Dad back to health, I'd better go back so he can nap properly. Pei-Ess, Trust me, you don't want pictures of what's going on here. No pictures today, but, please note, THERE IS A BLOG! Not only that, but it's MONDAY MORNING and THERE"S A BLOG! Maybe things are getting back to normal around here? Except for the lack of a pictures. I'd better stay on Mom to keep taking pictures, I don't want her to slack off you know, she'd never get back in gear. Here's my Monday Morning Report. Puppy is doing better and no longer smells sick. Mom and Dad smell a little sick, but I think that's just Puppy's influence. My ears are super itchy and gunky and Mom says she needs to clean them. Much as I hate getting my ears cleaned, I hate them being itchy more. I had a nice quiet day yesterday. Mom and Dad and Puppy went out and came back smelling like Grandma and Grandad, and sausages, and bread, and pea soup, and baked beans, all sorts of other yummy things. What did I get? Rollover. Mom says I don't need baked beans and pea soup, that they'd only make me gassier. Puppy has the gas concession at our house Mom says. Not sure what's planned for today, a walk I hope (Dad took me on a nice one yesterday). A cuddle maybe (I had a great nap with Mom on Friday and another one on Saturday)? Pictures - hopefully. If I don't post pictures, you'll forget what I look like! Dog forbid! Puppy has been sick so Mom and Dad have been really Puppy focused yesterday and this morning. Which is kind of ok, I apparently need a bath. I'll be happy if they forget that for a few more days....weeks....whatever. Does Puppy have to sit on MY bed though? (Mom sets him on what she thinks is THEIR bed and watches tv with him.) Sigh. That's MY bed. And he's crying a lot more. I don't cry when I'm sickies, I just hork things up on the carpet. Pei-Ess Mom is making me add that Puppy is doing a little better today. Write in your own blog Mom! Mom and Dad are both home with me today! WOW! I'll make use of that. First of all, I'll take them for a walk. Check! Done. It was a wonderful walk. Nice and sunny. Not warm yet, but it feels like it will get there. Plan number two. If I look cute and wonderful enough, someone should come and join me here for a nap. What do you think? Nothing new here really, sorry to disappoint. I spent the day contemplating the open bedroom window. All the LOVELY smells and noises that I was able to investigate from above. I even said hello to a few people, barked at a few others, you know, the usual. The last few nights involved Bolo Cuddle Sandwiches, so I had that to think about. I almost went to Day Care, but they were full up. That's ok, it still got me walks with Mom and Puppy. Pei laughter.